"Baby Mario Love" is the twenty-sixth live-action segment of The Super Mario Bros. Super Show! Its corresponding animated episode episode is "Koopenstein". In Mario Brothers Plumbing, Mario is in the middle of telling the Ratigator, who is holding a leash in its jaw, that he just took it for a crawl a little while ago, and won't take it for another one. After telling the Ratigator this, Mario begins to talk to Luigi, who is near the entrance of the apartment cleaning portraits on the wall, saying that they're lives are dull and lack glamor, glitz and a certain "je ne sais pas". Hearing this, Luigi tells Mario to watch his language, saying that the Ratigator is present, and also goes on to say to that he shouldn't worry, as he never knows when glammour will come knocking on the door. Just as Luigi says this, a knock at the door can be heard; opening the apartment door, Luigi nonchalantly exclaims that the queen of glitz and glammour, Susanna Ross, is there before slamming the door closed. As he walks away from the door, Luigi suddenly realizes what he has done and quickly re-opens the door and apologizes to Susanna, who had her nose banged by the closing door. After apologizing to Susanna, Luigi greets her, a greeting which Susanna returns and extends it to Mario. After the greetings are done, Susanna asks Mario and Luigi if they remember when they fixed her plumbing, which Mario and Luigi do remember, and goes on to remind Mario and Luigi that they promised they would be there for her in an emergency. Pulling her suitcase into the apartment, Susanna exclaims that she has an emergency while proceeding to drag her suitcase down the staircase and into the apartment. Setting her suitcase on the ground, Susanna states that her other band members missed their flights and, as she places wigs on Mario and Luigi's heads, asks if they can sing. Replying that they can, Mario and Luigi start to sing quite terribly and are promptly stopped by Susanna, who loudly yells that Mario and Luigi can simply fake their singing. Later, Mario and Luigi begin to get into the costumes and dresses Susanna has given, behind a curtain; unfortunately, Mario and Luigi are having some trouble getting their outfits on, with Mario trying to fit the dress over his overalls and Luigi putting his on backwards, while complaining he feels like the Hunchback of Notre Dame. Seeing Mario and Luigi flinging their clothes over the curtain concealing them, Susanna manages to coach Mario and Luigi into putting their clothes properly. Eventually, after tossing their boots over the curtain, Mario and Luigi announce that they are ready and go around the curtain, wearing dresses, high heels and wigs. Asking Susanna what she thinks of their outfits, Mario and Luigi get the response from Susanna that she thinks her career is over, which Luigi retaliates to by saying he thinks he looks pretty nifty. On the raised portion of the apartment floor, Susanna tells a sitting Mario and Luigi to take their places; getting up, Luigi walks on to the platform, whereas Mario struggles to get up, needing Luigi to help flip him on to the platform. Eventually, Mario, Luigi and Susanna get ready to practice their performance and, after dimming the apartment lights and turning on some colored ones behind them, Mario, Luigi and Susanna begin to perform, with Susanna singing the song Baby Love and Mario and Luigi act as backup dancers. At first, everything goes well, except for a small fight that occurs between Mario and Luigi, which is quickly stopped by Susanna. Its only when Susanna almost finishes singing Baby Love that Luigi interrupts, saying that the dress he is wearing won't work for him, as its the wrong color, which Mario agrees with. Susanna is left looking flustered as Luigi and Mario begin to point out various perceived flaws in their outfits. "Baby Mario Love" is the only live-action segment of The Super Mario Bros. Super Show! 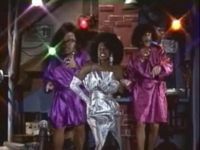 to feature a cover song in its live-action segment; which, unlike other cover songs, wasn't edited out in reruns, presumably due to the fact the segment centering around it and without it, the segment would become somewhat nonsensical. Which is why it it wasn't included on the Shout! Factory DVD sets. When Shout! Factory released the complete Super Mario Bros. Super Show! series on two DVD sets, four of the episodes were presented as "cartoon only" bonus episodes. The four missing "lost" live-action segments were: "Baby Mario Love", "9001: A Mario Odyssey", "Texas Tea" and "George Washington Slept Here". The first three of which were finally released on DVD, in Australia. The six disc set is a region free NTSC format collection that contains 50 of the 52 "Mario" episodes of the show. All episodes include the cartoon, live-action segments and Zelda previews (no Zelda preview for Day of the Orphan), but do not contain commercial bumpers. The missing episodes on this collection are "Rolling Down the River/ The Mario Monster Mash" and "The Unzappables/ George Washington Slept Here". All four of these "lost" episodes, including "George Washington Slept Here" are on a German DVD set, presented the same way as above, but without the Zelda previews. They are presented with dual English and German audio on PAL format DVDs. This page was last edited on July 27, 2018, at 02:40.